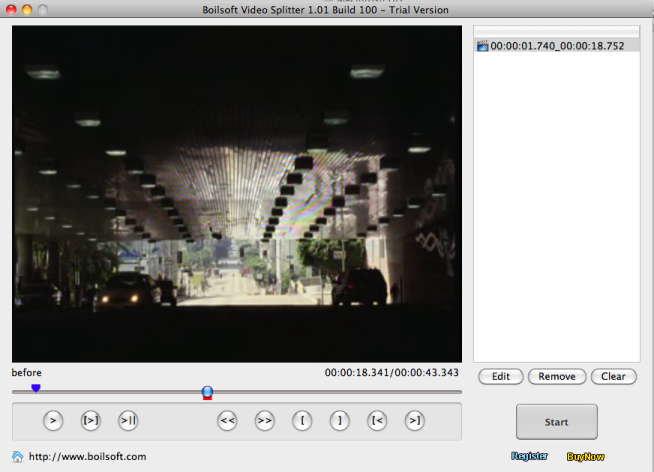 Boilsoft Video Splitter for Mac (http://www.boilsoft.com/videosplitter-mac/index.html) is a powerful Mac video splitter running Mac OS X to split video files. This video splitter for Mac also serves as a video cutter, movie trimmer for Mac users to split videos in any formats. Our splitter supports almost all popular video formats, such as AVI, Divx, MPEG-4, MPEG-1, MPEG-2, VOB, ASF, WMV, WMA, Real Media(.rm, .rmvb), MP4(.mp4, .m4a), 3GP(.3gp, 3g2), VCD (.dat), AC3, MKV, FLV,etc.. It also has a built-in player that helps you preview the video files you want to split at any time. When your file doesn't fit onto some media because of length or size, such as CDs, portable devices, YouTube, etc., our splitter can assist you in solving such problems efficiently. When you want to trim unwanted scenes and email the extracted parts to your friends, our splitter will become your excellent helper. * Support video file even larger then 2GB. * Intuitive interface, which enables you to use it efficiently and effortlessly.